Then Oviedo High School swimmer Zach Poti (Blue Dolfins) swimming at the 2016 U.S. Olympic Trials in Omaha. Photo by Michael C. Lyn for Florida Swim Network. "Hey coach, I am thinking about going out for swimming this year. Is there anything I need to do to get ready? Like many other high school swim coaches, I hear this a couple times a year from students that think that just because they grew up here in Florida, swimming in their backyard pool, that swimming will be an easy sport to compete in. While this *might* be true in states where swimming isn't quite as popular, like say North Dakota, in the state of Florida swimming is an ultra-competitive, year-round sport featuring some of the world's best athletes. Let me put this in perspective for you, if high school basketball was like high school swimming, then the high school basketball players would be going up against NBA players. If high school football was like high school swimming, then the football team would be lining up against NFL players. Florida high school swimming features some of the very best swimmers in the United States: athletes already at the very top of their sport. Many of the swimmers in the high school pool have already traveled the world, representing their country while competing in international competition. Let's take 2012, for example. In the high school pool you had Joseph Schooling, Missy Franklin, Katie Ledecky, (all Olympians). And if you think they were the exception to the rule, the state of Florida had over 100 high school swimmers go to the US Olympic Trials, all with an equal opportunity of making the 2012 US Olympic Team. In 2016, Florida had over 150 swimmers (and a good amount were high school age) attend the US Olympic Trials. Less than one-half of 1% of the nation's swimmers qualify for the U.S. Olympic Trials, so when I say these high schoolers are some of the best swimmers in the nation (and therefore the world) I mean it. Then H.B. Plant High School swimmer Morgan Tankersley (GTSA) at the 2016 Olympic Trials. Photo: Michael C. Lyn for Florida Swim Network. 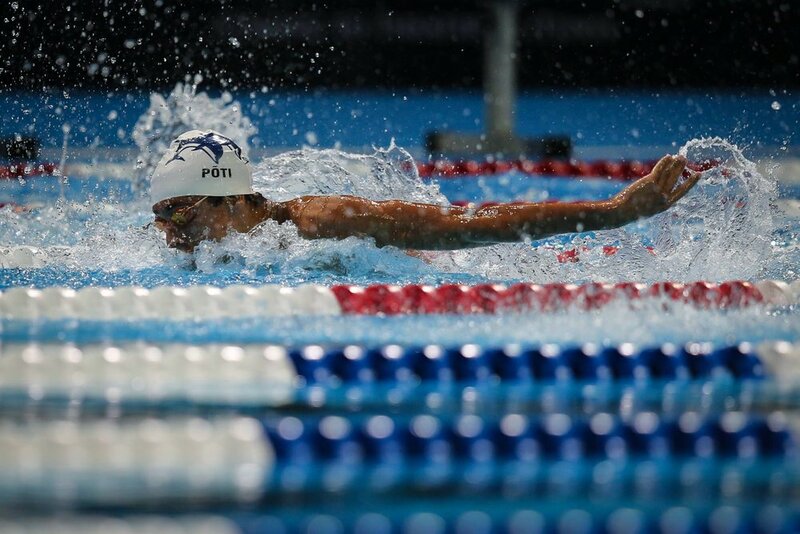 And during non-Olympic years, Florida high school swimming sees numerous swimmers representing the United States, Jamaica, Canada, Trinidad and Tobago, and many other countries in international competition at championships like the Junior World Cup, the Asian Games, the Commonwealth Games, etc. Current Florida high schoolers Talia Bates and twin brothers Isaac and Will Davis represent Team USA in Ireland. Photo by James Bates. These swimmers are already at the top of their sport, in that 1% of the best of the best, and we will see many of their names at the 2020 Olympics, whether representing the US or their family's home country. So when a regular, non-swimming student says, "Hey coach, is there anything I need to do to come out for the swim team?" all I can think of is: Yeah, get in a time machine and travel back several years and join a really good competitive year-round swim team. Now, I'm not saying it is flat-out impossible for a nonswimmer to catch up in just the 4 years of high school, but in my 27 years of coaching swimming off and on, I've only had one "walk-on type" ever be super successful at the high school level. Jim Kostowicz was a surfer whom I talked into swimming year-round in high school because he appeared to be a freak of nature (in a good way!). My hunch was correct and due to his natural athleticism, tall physique, and feel for the water, Jim went from surfer to Olympic Trial qualifier, high school state champion, and Division I college recruit. Jim was the rare exception, though, because for just about every other walk-on, they may attend practice for the season, but they will struggle to qualify for any post-season swimming. The season is just way too short! There are just too many elite, year-round swimmers competing in the state of Florida. And just like a racecar looking to shave hundredths of a second off its lap time, these high-level swimmers are already so honed in on their stroke and so well-trained that they have reached a level where they are just tweaking the tires looking to shave off time. They have already spent years leading up to this point. In fact, coaches talk about the "quad cycle" between Olympic years. We're looking at a four-year training cycle for our faster athletes, and for our younger athletes, we're looking at a yearlong training cycle, split into two parts-- short course season and long course season. How's The Team This Year? When a high school football or baseball coach asks me, "How's the team this year?" it's always a complicated answer. I've got a great group of kids who are working their butts off in year-round training. I don't believe there are any high school athletes that work harder. But, many of mine have not yet had the advantage of a continuous, multi-year development program. Some have been uprooted from Puerto Rico, Dominican Republic, Brazil, or Venezuela, while others have changed developmental teams a few times and have finally found a home here in our new year-round program, the Blue Dolfins. Individually, we'll have some great swims, All-Americans, achieve new school records, and a few might even win a state title in an event this year.